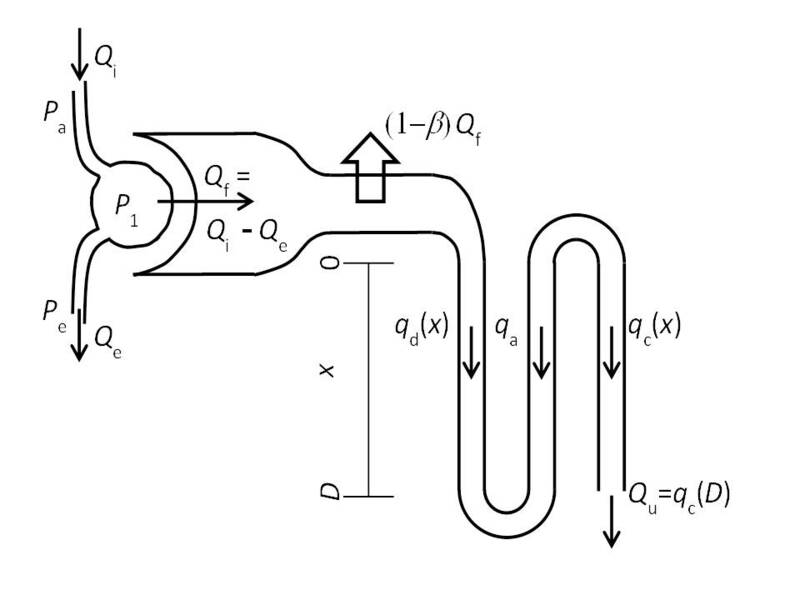 The mathematical model of renal blood flow, glomerular filtration, and mass transport in nephrons. The mathematical model of renal blood flow, glomerular filtration, and mass transport in nephrons (diagrammed in Figure 1) is composed of two main components, a model for renal blood flow and glomerular filtration and a model for mass transport in a representative nephron. Both components are based on modifications made to models presented in Chapter 20 of Keener and Sneyd . The blood flow and filtration model predicts glomerular filtration rate, glomerular pressure, and renal blood flow as functions of input arterial pressure. The predicted glomerular filtration rate and pressure serve as inputs to the nephron model, which predicts concentrations of sodium and flows in the descending and ascending limbs of the loop of Henle and a combined intersitium/ascending vasa recta space. Predictions of the overall model, shown in Figure 2, are compared to data on renal blood flow (2A), glomerular filtration (2B), glomerular pressure (2C), efferent capillary pressure (2D), urine flow (2E), and sodium excretion (2F) in low-salt fed prehypertensive and high-salt fed hypertensive SS and high-salt fed SR rats [2,3]. The mechanism of pressure-diuresis and pressure-natriuresis that emerges from simulation of the integrated systems is that relatively small increases in glomerular filtration that follow from increases in renal arterial pressure cause relatively large increases in urine and sodium output. Furthermore, analysis reveals the minimal differences between the experimental cases necessary to explain the observed data. It is determined that differences in renal afferent and efferent arterial resistance are able to explain all of the qualitative differences in observed flows, filtration rates, and glomerular pressure as well as the differences in the pressure-natriuresis and pressure-diuresis relationships in the three groups. The model is able to satisfactorily explain data from all three groups without varying parameters associated with glomerular filtration or solute transport in the nephron component of the model. Thus the differences between the experimental groups are explained solely in terms of difference in blood flow regulation. 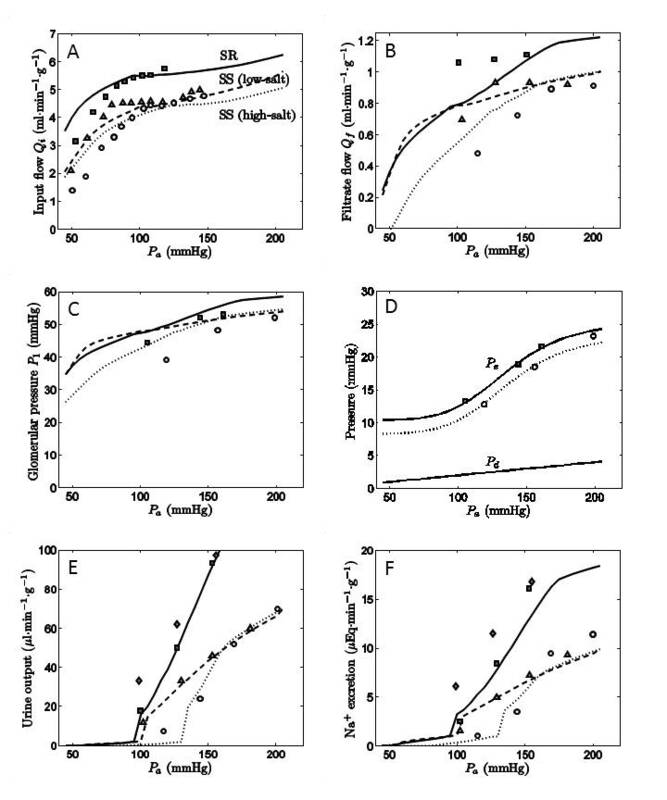 This finding is consistent with the hypothesis that, if a shift in the pressure-natriuresis relationship is the primary cause of elevated arterial pressure in the Dahl S rat, then alternation in how renal afferent and efferent arterial resistances are regulated represents the primary cause of chronic hypertension in the Dahl S rat. Beard DA and Mescam M. Mechanism of pressure-diuresis and pressure-natriuresis in Dahl salt-resistant and Dahl salt-sensitive rats, BMC Physiology 12:6, 2012.